Every year workers, families, employers, and communities come together at ceremonies held around the province to remember those who have lost their lives to work-related incidents or occupational disease, and renew our commitment to creating healthy and safe workplaces. Once again representatives from DC 38 attended the ceremonies held this year at the Sanctuary in Hastings Park, Vancouver, and at the Legislature in Victoria. 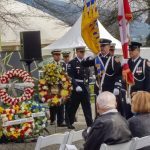 Since 1997, the BC Federation of Labour, the Business Council of British Columbia, and WorkSafeBC have co-hosted a public commemorative ceremony for the Day of Mourning in Vancouver, B.C. 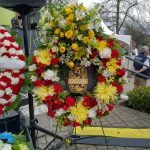 In 2001, WorkSafeBC, the BC Federation of Labour, and the Business Council of British Columbia dedicated a permanent workers’ memorial in the Sanctuary in Hastings Park, Vancouver. There are approximately 45 permanent worker memorial sites sponsored by WorkSafeBC in British Columbia. On Fri, Apr 28, 2017, people across B.C. stopped to recognize and remember the more than 140 British Columbians who died last year as a result of workplace accidents or work related illnesses. District Council 38 will continue to attend these services as long as workers continue to be injured or killed on the job, in an effort to hold those responsible to task for each tragic death or life altering injury. Representing painters, glaziers, lathers/ISM, tapers, and allied trades. © 2019 IUPAT District Council 38.